Those Water & Wave Semester students are about to board those flights, head to Costa Rica, and spend 70 days with complete strangers; this list of unknowns includes their trusted instructors. Who are they? We know 'em. We love 'em. We learn from 'em. We laugh with 'em. Almost every CRROBS student that hikes through parts of Costa Rica's jungle has been lucky enough to pass through the homestay (what is a homestay?) of this 20-person immediate family's village in Piedras Blancas (just north of Brujo). That's right: we said "20". Doña Flor and Don Hormidas raised 18 biological children, all born within two years of one another. Right now, CRROBS employs many of them as instructors, drivers, managers, chefs, and homestay hosts. We have a very unique and close relationship with this special family. See below for the full run-down. Not only is this family unique because of its size and self-sufficient village, but they have taught our students - AND US - a lot about the quality of life. It is here that many realize how important their own families are - that people win out over material things. They learn that hard work pays off, especially after hours of helping cut sugar cane and squeezing it, milking cows, grinding corn, tilling the land, and making food from scratch. It's an eye-opening view of how simple life can be. And it's not all work. 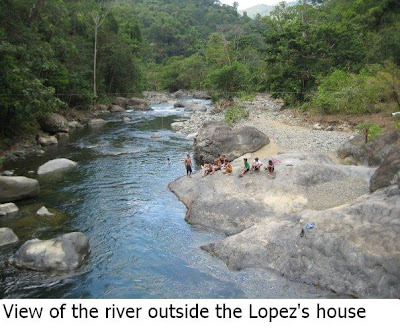 Hours of soccer with the local students, waterfall rappelling, swimming in the river (see below), and laughing around the kitchen table fill the time well. There's a reason students respond "homestays" when asked what their favorite part of the course was. To read a recent update from our newsletter, click here. To watch a video that gives a panoramic view in the Lopez's village of Piedras Blancas, go to our Video Tab on our Facebook page. There are so many small towns through which our hikers trek when going coast to coast. It's hard to locate them online due to the vast areas of rainforests, yet we found a way to map out the first few days of Tri-Country's 85-day hike! We'll try to continue the mapping as they continue, so stay tuned. To see a live map, click here. To see this image in a larger size, click on it. 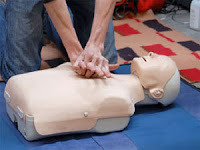 Most of us who have ever been in a CPR course are familiar with this emergency questioning. It’s what we say to our appendage-free dummy, nicknamed Annie, when her rubbery plastic face does not respond to our shaking and talking. And when she doesn’t respond to the questioning mentioned above (almost 100% of the time), we have to call for help and begin CPR. For those new (or old) to this certification process, here is a standard procedure learned during a CPR certification course. Our Tri-Country students are spending Day #2 in Costa Rica getting this certification today from our CRROBS instructor, Daniel Jiménez Fallas (Danny). They began at 6am, spending the whole day in "class" to learn what it takes to resuscitate a victim in cardiac arrest. This certification lasts for one year – plenty of time to cover their 85-day course. Many of our students leave course, wanting to relive their glory days in Costa Rica when they experienced unique activities, connected with the environment, challenged themselves, practiced Spanish, learned new skills, self-evaluated, stayed in shape, and/or ate incredibly tasty and amazing local food. While we can't provide solutions for every one of these nostalgic desires, we can at least help alleviate the memory-lane strain. One way of doing this is helping you cook some of the local food at home for yourself and your family/friends. The first Tico food item you can easily learn to prepare? 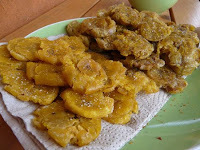 There are two very common - and easy - snacks/desserts to make from plantains: maduros y patacones. Differences: Patacones (shown in the photo above) are in the shape of a sand dollar made with unripened green plantains, and maduros are ripe plantains cut long-ways. Patacones are on the salty side, and maduros are on the sweeter side. For a recipe to patacones, go to our newsletter article by clicking here. So go out and find some plantains to fry. If you request more recipes from your experience here, please 1) request them on our Facebook fan page wall at http://www.facebook.com/crrobs, 2) go to our newsletter archive (each one has a Tico recipe), or 3) send an email to crrobs@gmail.com for a specific request. *a Tico phrase used before meals with the same meaning as the common French phrase "Bon appetit! Have you or your child been diagnosed with NDD? After all the disorders being defined these days, there must already be some research and treatment in place for this one. In a recent NY Times article entitled "How to Lick a Slug," columnist Nicholas Kristof mentioned this term (first coined by author Richard Louv) after a hike he and his daughter accomplished in the Pacific Crest Trail. He discusses the problems children face these days being out of touch with nature. It's an important topic, bringing up issues such as environment preservation, children's mental/emotional/physical health, and quality relationships among families. Costa Rica Outward Bound obviously can't agree more with the need to bring people back into touch with nature; or shall we say, bring people to nature for the first time. It is through these experiences in the rainforests and staying at homestays that our urban students learn how to cook for the first time, wash a dish, be responsible, learn about plants and bugs, get dirty without caring, gain social skills by associating with new people, discovering ways to preserve the environment, and find new appreciation for their family relationships. Some lucky students discover a new drive for life, break out of their depression, and/or find that they no longer need certain medications to get through challenges. Yes, indeed, there is something to be said about a connection to the outdoors. Join us in our fight against NDD.